In the following diagram, you can click on the price on the left and get tips of choosing a bow in each price level. Also you can click in the middle at our "series" and get tips about them. Basics of how to choose a bow. You can either choose by your current level, or choose a higher level you're planning to go. With WangBow, the good thing is that you can always find a higher level bow without raising your budget. Let's start from some basics. Have you decide on stick materials? Are you looking for a Pernambuco or Composite stick, or IPE? Do you know details about them? Though there's some differences on different instruments, but from our experiences, there're right ways to choose. Let's start from following 4 tips. For most bows more than $50usd(retail price)of now days,you don't have to worry too much about this part, keep in mind is ok.
Needless to say, the balance point of the stick is more important than weight, it's already known throughout the world, and taken great care by all makers. Pick up a bow and hold it at a 45-degree-up angle. A bow should feel natural in the hand well balanced from tip to frog with equal weight throughout. You need to pay extra attention to it, if you are buying a bow below $50, such as from some non-professional sellers on Ebay.com. Anyway, at the price of $50, you're buying Chinese origin bows in most cases, and seller probably don't know the maker's names. We suggest you buy at your local shop after try them out for their balance & weight at this level. For wood bows less than $100usd(retail price), a lot of them are a bit or too soft to play. For maker, stiffness is affected by a lot of factors, it's related with material, and if it's well seasoned, diameter of the stick, shaping of the camber, and so on... Good maker will choose a good combination for one stick to make it more stiff and playable. Carbon graphite or other composite stick can be seen as exceptions, but for lower price composite bows, they're likely to be too stiff, the sound is always too "cold", not good for part of players that playing non-electric instrument. You must have noticed, we don't use fiberglass sticks in our workshop to make a bow, we feel it's too stiff. Stiffness can be measured, most branded bows have their own standard to categorize bows into different levels to meet their standards. For non-branded bows, it might be more complicated and can only be tested by seller or yourself. You need to know about not only who make it, also how the shipping and stocking are handled. It's not a big problem if you're buying from us, even our STUDENT series bows are pretty good-looking. Thanks to a lot of bow making schools open to public, the making techniques has been so matured that we believe it's not a problem with 90% of experienced makers all over the world now days, the crafting procedure is no big difference from each other. What else we need to pay attention to is "logistics", especially for wood sticks, starts from the day a bow leaves the maker's hand till the day it reaches the player's, including the shipping and stocking environment in the process. If a bow is not protected and handled very well, with half a year or even longer time stocking, it might even get wet or some severe damages. In this situation, player may think craftmanship is bad without knowing it's not the maker's problem. More expensive the bow is, bigger possible loss will be, they are sold at slower speed. It's good that some professional dealers have environment control rooms, but frankly some marketing strategies,such as "return policy",do harm to the bows. In some cases a delicate wood stick have to travel around the world. Seller should spend some time to re-examine carefully upon returned bows,and down-grade so, sometimes a re-hair or re-varnish might be necessary. 4.Price & Where to buy. Buy $500usd bows or below from Chinese (We seems to have nothing, but today we actually supplying 80% of bows across the world). As one of the Chinese best workshops, I have to say, that Chinese bow makers have improved very fast since 30 years ago. Needless to say there's so many famous Chinese Violinists helping this process that makers need to give thanks to. Also many thanks to our 3000years traditions of making supper fine artifacts. A bow maker of now days might use some machines or tools to help crafting, but the bow is still mostly a hand-made artifact. Though this artifact has been well commercialized, the selling prices of different makers are still so different with the same "design of the bow". The fact is a normal player don't know if a bow with higher price is with higher quality comparing with others in the same instrument shop. There's no easy way out at this time, you have to try bows by yourself without knowing the price and maker, so that you can find a good bow. Though not always, a workshop name or a maker's stamp still represent the bows quality. Try to find some introductions about who make the bows before you buy. You need also be careful if the maker's name is boasted. The best place to choose a bow is always in a local shop, but price will be higher, and bow brands in one shop are limited. Also checkout following tips of buying a bow from internet. How to buy a violin bow from internet? There're a lot of articles and tips telling you how to choose or select your violin bow or viola,cello,double bass bows. You might be still confused or even more confused after reading carefully through them. Frankly it's also a difficult task for ourselves to write a helpful article for you. The following might be fresh information to you. Now days, a lot of people look for a bow online, not in a local shop. Please decide by yourself after you read through. First things first, you need to know what's behind the website, it's the most important thing. There're 4 kinds of online stores selling bows. 1, With Ebay.com. You may receive a good bow out of lucky,or buy a famous branded bow at lower price. 2, With professional bow trader,such as S*music.com. You got good quality/$. 3, With many other online instrument super-market (those have a local shop not included). You may got a lot better price than S*music.com, but you never know if the quality are the same. And they also sell famous branded bows at all prices, maybe higher than the same bows in Ebay, nobody have time to check out them all anyway. 4, With Makers, Workshops or professional dealers that have a website, maker's direct price are extremely high in most places, but their quality are always promising. Professionals can always give you valuable instructions, they maybe can't play violin very well, but they know bows better. You can have some idea from the chart above, and within those 4 kinds of sources, try to contact several with each of them. And you'll find the source suits you the best. Our suggestion is you buy from Pros, you save your time greatly buying from the professionals, and avoid making mistakes. Our "MASTER" series are for Orchestra & Band professional performers. Most of violinists use our "MASTER" as practicing or 2nd bows. Some amateur performers also came to us and choose "MASTER" bows. We offer lifetime free re-hairing service for "MASTER" in our workshop. 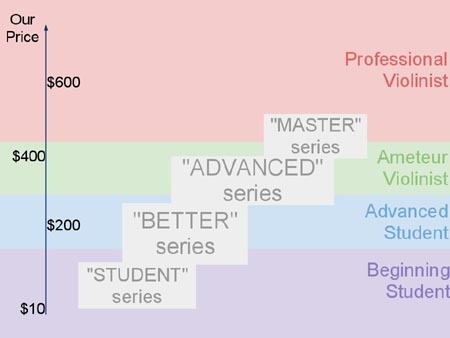 Our "ADVANCED" series are for levels from advanced students to professional performers. This is our best-selling series along with "BETTER", the price is acceptable for an improving student, and quality is acceptable for a violinist. Free 1st year re-hairing in our workshop. Our "BETTER" series are for levels from entering level students to amateur performers. "BETTER" is better than "STUDENT" at craftsmanship & balance. Our "STUDENT" series are for all levels of student players. It's very very difficult to find same quality at this price in the market. Bows around $10usd(retail price), can be bought from Ebay.com and Amazon.com. Experienced teacher won't suggest a student or even a starting student to have a $10 bow. There're plenty of acceptable entry-level bows around $50. Bows around $200usd(retail price). An instrument shop owner will probably recommend you a Chinese bow for this price range. Though these bows may have a non-Chinese brand name, there're great possibilities that a fairly good $200 bow is original made by a Chinese maker. Go to the shop or online-shop you trust to make this buy. Players buy in this price range often have too little knowledge and experiences of choosing a bow, so it's very important for you to have some professionals or some trust worthy shops to help you out making the buy. 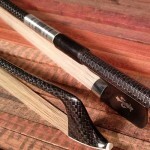 At this price, carbon graphite bows are also available. If this is your first page view with us, I need to make it clear that our prices are always at a lower level not only in our online store, also in our dealer's shops. Bows around $400usd(retail price). It becomes complicate, in this price range, players have more experiences, but also facing more bows from different workshops or with different brand names. You need to spend more time to try them out by yourself, "feelings" plays more important part during the process. We suggest you go and check some brands that is more popular, instead of spending time on non-branded bows. We offer bows in our "ADVANCED" series and "MASTER" series for you to choose in this price range. If this is your first page view with us, please understand that our prices are always at a lower level not only in our online store, also in our dealer's shops. Bows of $600usd and above(retail price). You still can tell us what you want, and see what we can do together to make a most suitable bow for you. Check out more about us in this website.